At first glance the song Cult of Personality by the band Living Color seems like a wonderful addition to lessons for Black History Month or a Civil Rights unit. The song begins with quotation from Malcom X…..a snippet from his Message to the Grass Roots….a speech that was given to unify African Americans on November 10, 1963. The quotation inserted in the lyrics is: “and during the few moments we have left…we want to talk right down to earth in a language that everybody here can easily understand.” The quotation is a little altered from the actual speech, but it’s easy to see how Malcom X was trying to point out the differences in Black culture and how unification was needed to move civil rights along. But is this song really speaking in a language we can all understand or is there more to the message? Hmmmm…..doesn’t it appear to you that there is much more going on here than a reference to the Black community? You have the quotations from John F. Kennedy at the beginning…..Ask not what your country can do for you…..and ends with a quotation from Franklin D Roosevelt….The only thing we have to fear is fear itself. There are also references to Benito Mussolini, Joseph Stalin, and Mohandas Gandhi. Notice the pairings….Gandhi with Stalin and Mussolini with Kennedy…..leaders that are traditionally good paired with leaders that are traditionally bad. Another reason to go hmmmm……. Perhaps the next step is to take a look at the group that performs the song. Living Color is a band that formed in 1983 and, is often lumped into the Hard Rock music category. Their music can also be termed as American Funk . Their songs often attack Eurocentrism and racism in American which is understandable since every member is black. But I’m still troubled by the references to various world leaders. What do the actions of world leaders have to do with Black History? Clue in on this particular section of the lyrics. I exploit you still you love me. Cult of Personality…I exploit you still you love me. Slavery, of course, was exploitation in the worst possible way. While there were some very extraordinary relationships between slaves and their owners, I’m not sure the song’s lyrics are taking us in that direction. Instead, I turn to the terrible things Stalin and Mussolini did….terrible things… yet they were able to obtain and maintain solid power. Their followers were a cult of sorts. When we examine the media machine that propelled Kennedy and Roosevelt into the White House we see a process of publicity that was so successful both former presidents maintain larger than life personas despite various flaws in their personal and political lives. Cults of personality actually exist. A cult of personality occurs when a leader uses mass media to create an idealized or heroic public image using flattery and praise without a balanced viewpoint. Cults of personality are often associated with dictatorships such as Stalin’s. The hero worship surrounding him resulted in grandiose titles such as “Brilliant Genius of Humanity”, “Coryphaeus (the leader of the chorus in an ancient Greek dram) of Science”, and “Gardner of Human Happiness”. The title of murderer would be more appropriate. Like other dictators who found themselves the proud recipient of a cult of personality Stalin was fond of having cities and towns named after him and was notorious for rewriting the history books to follow his version of events., and hang the truth. Cults of Personality are also associated with regimes or administrations that want to radically change society utilizing revolutionary ideas. That can certainly be said to a point regarding Kennedy and Roosevelt….even Gandhi, of course. Makes sense to me…..rock bands do have cult followings. Ronald Reagan? Obama? Most certainly. For that matter a cult of personality can be identified surrounding our very first president, George Washington. The cult of personality surrounding our first president began soon after his death as he became the subject of mythmaking via the stories Parson Weems.spun. Remember that cherry tree yarn? Washington loaned his name to various monuments and buildings. One of the best examples of the deification of Washington is seen by thousands every year as they gaze up into the Rotunda of the U.S. Capitol. 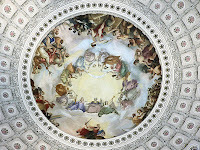 The picture I began this post with is the central section of the Apotheosis of Washington by Constantine Brumidi (1865). The section portrays Washington rising to the heavens in glory. The word apotheosis refers to the rising of a person to the rank of a god – the glorification of a person. So, could I use the song Cult of Personality for a Black History activity. Perhaps…..but, I think I could get much more mileage out of it to head off down the path regarding the song’s title, it’s meaning, the various ways a cult of personality exists, and how we can avoid them. I think the discussion would benefit any classroom across the country. Just take a look at any gossip or political website.....we'll admire and fawn over anything. 13 Quick Facts Regarding "The Federalist"
At some point during your high school government class or college Political Science course you had to read The Federalist. Jacob Cooke in the forward section for the collection of essays writes….the authoritative exposition of the Constitution [and] occupies an unrivaled place in our national political literature. 1. There are actually 85 articles regarding the ratification of the United States Constitution. They were originally published with the titles "The Federalist, No. 1”, The Federalist, No. 2”, etc. 2. Originally only 84 essays were written – not 85. The extra essay came about when the 31st essay was split. The 29th essay was also moved to follow the 34th to make the sequence logical. 3. The set of essays are the go-to source when interpreting the Constitution. By 1788, two volumes containing the essays were published with the title “The Federalist”. While many collections of the papers now carry the title The Federalist Papers, it is a misnomer. 4. The articles capture the motivation and philosophy regarding our version of government. 5. While most of the articles were written by Alexander Hamilton they were also penned by James Madison and John Jay. John Jay is always listed as an author, and he should be, but compared to Hamilton and Madison his contribution was very limited. 6. However, originally the authorship was a closely held secret. The pseudonym “Publius” was used. 7. Hamilton tried to list others to help – Gouverneur Morris, who declined to help and William Duer, who unfortunately did not meet Hamilton’s exact writing standards. Later his essays were added under the name “Philo-Publius”. 9. By 1792, the secret was out regarding authorship when a French edition of the essays identified Hamilton, Madison, and Jay. 10. Once the Constitution was proposed for ratification by the Federalist convention there were many articles and letters to the editor of the papers that published them opposing “Publius”. 11. The series of articles appeared in three newspapers – the Independent Journal, the New York Packet, and the Daily Advertiser. 12. Hamilton and Madison both claimed to have written several of the essays – 18 through 20, 49 through 58, and 62 and 63. Today after computer-based analysis of word choice patterns indicate Madison wrote all of the disputed essays. 13. The purpose of The Federalist was to focus on New York voters – to sway them to choose delegates to the ratification convention that would support the Constitution. Unfortunately, New York took the side of the Anti-Federalists – so in actuality The Federalist failed, and citizens in states like Delaware, Maryland, New Jersey and Georgia never saw them prior to ratification. You can view an online version of The Federalist (the McLean version) here. I have this pair of magnets on my fridge. They don’t really belong to me. I confiscated them years ago from a student. He was throwing them up in the air, and as they whizzed past each other they bumped against each other making clicking and zinging noises as they fell back towards his outstretched hands. Over and over he threw them up in the air. The young man throwing them was a very intelligent student. It was possible for him to comprehend every word I said during those few precious minutes of instructional time, BUT there were students around him that weren’t as fortunate. They were being distracted. So was I for that matter. I confiscated them because they were disturbing a lesson….I confiscated them because I was protecting the general welfare of my classroom. I simply grabbed them and kept on going with my lesson without missing a beat. While I continued to talk I took the few steps to the back of them to place them on my desk. To find out what happened to those magnets and how they could even remotely relate to President Franklin Pierce, the Doughfaces, and a plan to wrest Cuba from the Spanish read the rest of my post at American Presidents Blog. While most of my students learn history in a school setting from educators like myself, we cannot emphasize family history enough. Family history helps students to realize their place within their families as well as how they fit in with historical events. Learning family history can answer questions regarding when relatives first arrived in North America and where they settled. Details regarding everyday life can be internalized, and the effects of certain events can help us connect to events we didn’t live through such as the Great Depression or World War II. While there are many ways to go about learning family history one of the best ways to go about it is merely to listen……listen to those older members of your family. I don’t mean merely nodding your head at them, smile, and wonder when you can escape them. I mean really listen….and that means to listen with a purpose so that real communication takes place. StoryCorps provides a fantastic opportunity for generations from the same family to communicate regarding family history. Their main goal is to honor and celebrate one another’s lives through listening. Find out more about the fantastic work StoryCorps is doing over at my other place…….Georgia on My Mind.